As Animal Bedding suppliers and animal lovers, here at Phillips Brothers Wood Shavings we love a great show, and this year’s Suffolk Show was our most successful to date. The amazing turnout meant that the foot fall to our trade stand kept us so very busy meeting prospective and current customers who made the event even better with great feedback on our products, services, and team. We also took the time to enjoy the glorious weather and superb equestrian events. The Phillips Team with Sponsored Rider Grace Gerry. 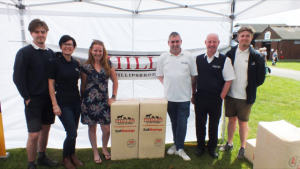 This year, The Suffolk Agricultural Association, the organisers of the show, personally invited Phillips Brothers to supply the horse bedding for the exhibitors & competitors in the Horse Vehicle Park and Stabling. For the SAA to place their faith in us is truly an honor and a show of trust in our brand, products, and service. To make this whole event as enjoyable and stress free as possible for the equestrian exhibitors and competitors, we had a collection point in the horse vehicle park. A pre-order form had been sent out with tickets as an option to order in advance or bedding was available to buy from the collection point on arrival. The advantage of this was that competitors didn’t have to bring their bedding with them, creating more space in their transport vehicles and having one less thing to think about packing. Our very own Rhys Knapp would then take their bedding directly to their stable, removing the tiring task of lugging bedding across the show. One of our biggest successes this year was our ability to connect with so many people and be of service. 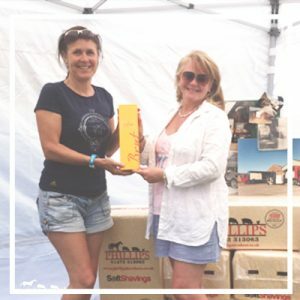 In addition to this, we were very fortunate in that our sponsored riders, Grace Gerry and Jo Williams joined us at our trade stand, providing advice on our products, riding, and Eventing. Considering how busy they both are competing and teaching we are so grateful that they took time out of their schedules to be ambassadors of Phillips Brothers. Grace Gerry had just completed the 3 day Horse & Hound Championships, placing 9th the weekend before the show and was still running on adrenaline and very happy. The winner of our prize draw, Susan Taylor also popped by to pick up her prizes, here she is with Jo Williams, our sponsored rider. As per our prize draw, Susan won two free tickets to the Suffolk Show and a bottle of champagne! We are thrilled with how many people entered our prize draw and will look to do similar campaigns again in the future. Congratulations Susan on winning our first one we hope you had a fab day! 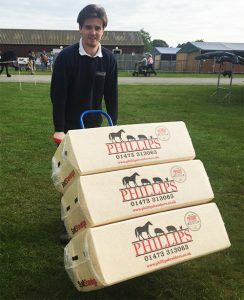 Here at Phillips Brothers, we take great care and effort to ensure that the wood shavings and animal bedding we supply are of the highest quality and the service is efficient but personable, so hearing the positive feedback from so many people at The Suffolk Show felt marvellous, many of the comments were about our fantastic delivery drivers and their hard work. Well Done Team Phillips.